Right, I wouldn't bother with the cattle or the faith bonuses. The coffee you could have, I suppose. Maybe adapted slightly. And I see that you have already worked out the number of starting regions, but I think it would be cool if the neighbouring countries started neutral. ManBungalow wrote: Right, I wouldn't bother with the cattle or the faith bonuses. The coffee you could have, I suppose. Maybe adapted slightly. Well all three are very typically Ethiopian....how would adapt the coffee bonus...idea? Cool...why...what are your reasons here please? You could spread them over the map. But see if anybody else can offer any ideas here. For one thing, they're not actually Ethiopia. And they offer quick links to bonuses on the other side of the map...really powerful borders. Coffee...well it is only grown in the regions shown, so it would be silly i think to have them eslewhere. The other countries...OK....good point...and good stratgey, however, will it affect GP drop too much? It would add another 7 neutrals. I would offer 4 of those external countries to be neutral, to make the starting neutrals 9 in total. For the drop above, i don't see the 7 player game as being too much of a problem. 7 player games account for .01% of all games played on the site. I just got back from a long vacation and still trying to get my bearings back, so bear with me , but I don't like the new bonuses at all. They clutter the space up and are going to require a lot more neutrals to be placed around the map. nolefan5311 wrote: I just got back from a long vacation and still trying to get my bearings back, so bear with me , but I don't like the new bonuses at all. They clutter the space up and are going to require a lot more neutrals to be placed around the map. OK, are any of them useful? or should they be excised completely and leave the map as simple as possible. That is probably what I would do. 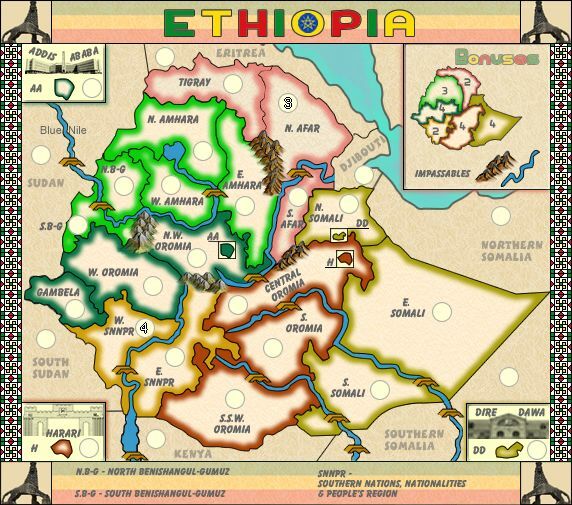 Re: Ethiopia: [9.1.13] V05-P3 Gameplay? so i'll get rid fo them....going back to previous version 5 then we can move forward again with other stuff. You still need to include the impassable legend. I suggest putting it above the bonus legend. 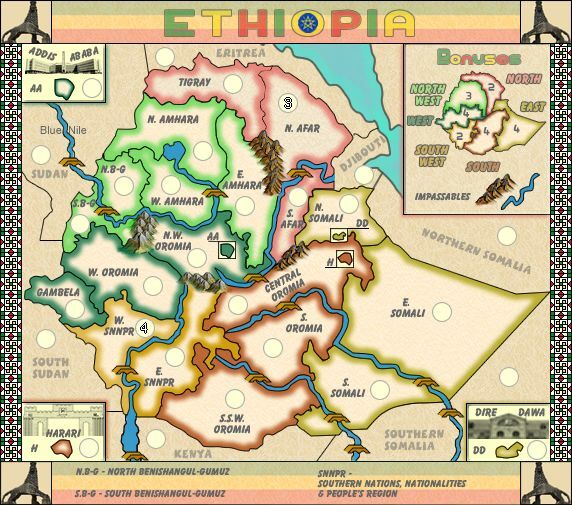 As can be seen in N.W.Oromia, the mountains could do with a touch up so they blend with the map and the colours better. Sorry your previous changes didn't go down well. x-raider wrote: You still need to include the impassable legend. Dont be sorry about the changes...some things aren't meant to be. cairns, I will go ahead and sticky this one for the stamp, but I suggest removing the neutral starts from all the capitals since they don't have any significance (that I can see) other than increasing some of the 3 region bonuses to 4. 27 starting regions is also a golden number and in 1v1 games increases the amount of starting regions per player from 8 to 9 which I prefer on a map this small. Also, in the continents the capitals are in, you don't need to worry about bonus dropping since all those continents are 4 regions. As long as N. Afar and W. Snnpr start neutrals, there's no need for any other to. If anybody else has any suggestions, now is the time to speak up. 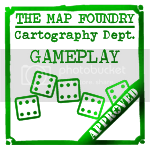 Otherwise, this map will receive the gameplay stamp in 48-72 hours. nolefan5311 wrote: cairns, I will go ahead and sticky this one for the stamp, but I suggest removing the neutral starts from all the capitals since they don't have any significance (that I can see) other than increasing some of the 3 region bonuses to 4. 27 starting regions is also a golden number and in 1v1 games increases the amount of starting regions per player from 8 to 9 which I prefer on a map this small. Also, in the continents the capitals are in, you don't need to worry about bonus dropping since all those continents are 4 regions. As long as N. Afar and W. Snnpr start neutrals, there's no need for any other to. OK, but is there any need to increase the amount of each neutral in those territories i.e. once SNNPR is taken it's an easy +2 to add to any player's army. You could increase it to a n4 if you'd like. ian and I discussed this and came to the conclusion that if there are not starting neutrals in the larger continents, players my focus on grabbing one of those and not dedicate troops to the smaller bonus. But making it a n4 won't hurt anything. PS...give me a couple of days...the V07S.png master file is kaput, so i'll have to re-work everthing from a previous version. Bummer. nolefan5311...the file is recovered and re-worked...posted as V7 with the ajdustment to neutrals. Onwards and upwards cairns. Congrats. First impressions: The map colors are kinda bright for me, especially for a desert country. Some more earthy tones would be quite good for me, personally, but the rest of the community will likely have a say as well. Question, where is the border between Sudan and South Sudan? Also I assume Kenya and South Sudan are adjacent, yes? There is a border line from the box from H Harari to W. Snnpr that oddly separates nothing and calls into question what connects to what exactly. The word "bonuses" in the legend minimap seems kinda redundant to me, do correct me if I'm wrong here community! Also a question to that, are the cities within regions a part of their respective bonus? if necessary a pit of explination to that may be required. Oh, and do the bonuses have names themselves? RedBaron0 wrote: First impressions: The map colors are kinda bright for me, especially for a desert country. Some more earthy tones would be quite good for me, personally, but the rest of the community will likely have a say as well. well some colours are taken from the flag, mixed with some earthier tones...or so i thought...so i have reduced opacity on them for you to hopefully an aceptable level. Question, where is the border between Sudan and South Sudan? Also I assume Kenya and South Sudan are adjacent, yes? There is a border line from the box from H Harari to W. Snnpr that oddly separates nothing and calls into question what connects to what exactly. yes that is same border...bridge across river near lake connects that piece of land and border is horizontal line running east from Harari. mmm...not presently, but need to do something there, so will fix that. I still don't think the sea needs 2 colours, just the cyan on the inside should do fine for all of it. 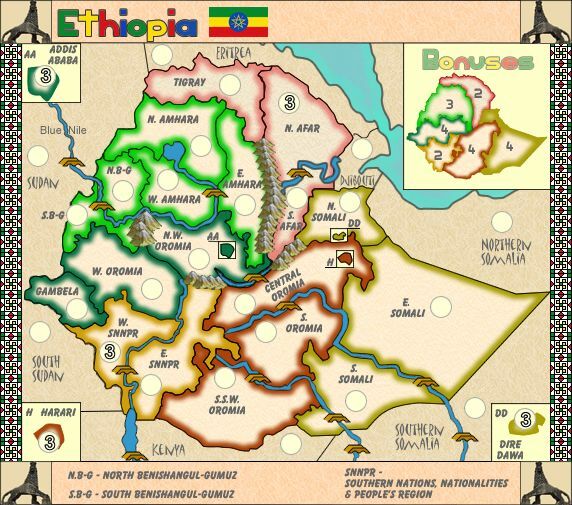 The building image for Dire Dawa is a bit blurry and the text explaining the abbreviations at the bottom should be lined vertically centered and evenly distributed.